I finally decided it was time to dust off the gardening gloves and head back into the Cottontails garden yesterday. I'm afraid it's been more or less ignored since I wrote my last post here in October and it is in a bit of a sorry state. Anyway, massive root vegetables aside, I made good progress by weeding and digging over the herb / salad bed. No sign of the 'overwintering' peas and beans that I planted in October. Should they be shooting up by now? Is the monster parsnip edible? goodness me Charlotte! 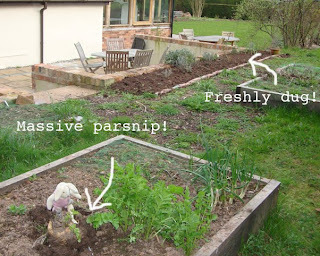 that is one BIG parsnip! will do Wesley for at least a year!! 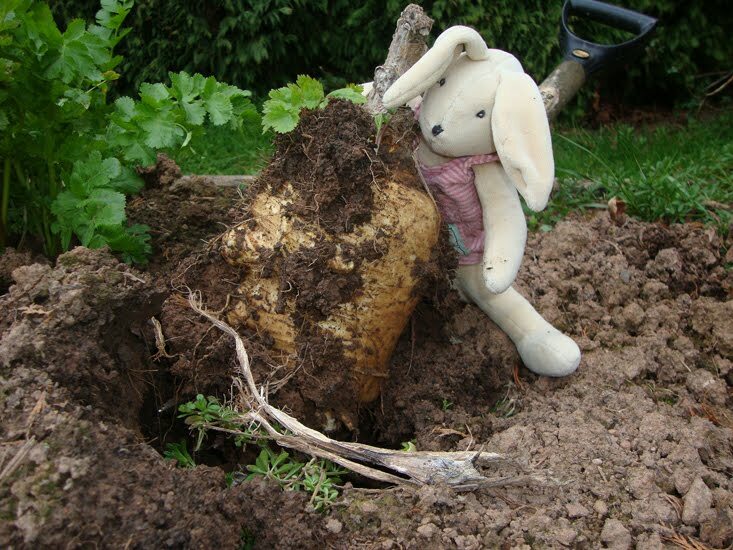 Now that's one humungous parsnip! I would be thinking soup too! I always find it amazing how sweet tasting parsips are.